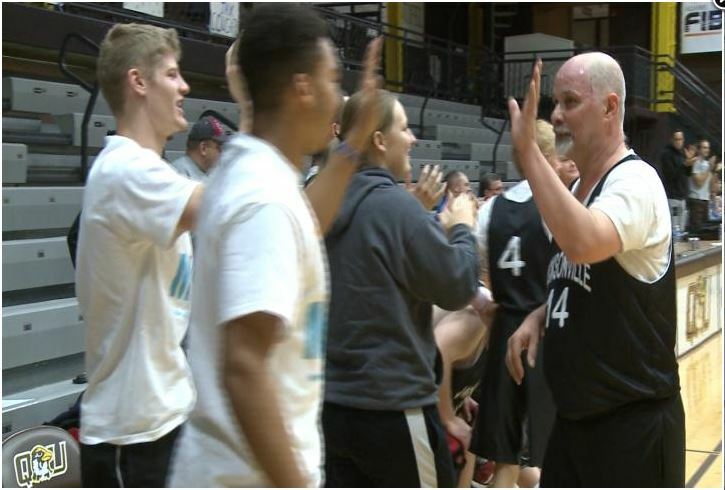 QUINCY – At a Special Olympics basketball tournament at Quincy University Sunday, Dec. 6, every basket made was met with thunderous applause from the QU student athletes that volunteered for the event. “I was there to support them and give them tips and congratulate them on anything they did,” said QU men’s basketball player Grant Meyer. Kelsey Krekeler swims for the QU women’s swim team and is a member for the QU Hawks for Special Olympics club. She says she was smiling along with the Special Olympics athletes the entire day. 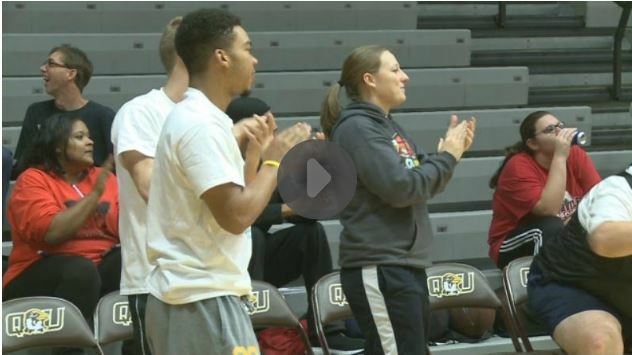 Through QU Hawks for Special Olympics, the athletes had a chance to learn from the men and women of the QU basketball programs that volunteered as guest coaches. “They taught me to shoot and dribble the ball,” said C.J. Evans of Beardstown. “They were giving us pointers. They showed us how to set our stance before our shot. It was great,” said Rouloau. Sometimes, the Hawks even learned a thing or two. “They all came to me when I shot one and missed it,” said redshirt-junior guard Von Washington. As the clock hit zero the Jacksonville team claimed the championship. “Words just can’t explain how happy (we were) to be able to come all the way from Jacksonville and Decatur to come here to play,” said Rouloau. Everyone, however, left with new friends.